Fully prepared and ready to eat - hot when you have a few minutes, or cold when time or conditions don't permit a fire. SURE-PAK MRE Field rations are the great food solution for outdoorsmen, backpackers, rescue workers, and anyone who needs a fast way to have a nutritious meal without the delay of cooking. The SURE-PAK 12 Meal case is designed as a top-of-the-line, fully-configured meal. Case features 12 retort pouched Main Entrees, 12 Sides, 12 Dessert Packs, 12 Crackers, 12 Spreads, 12 Beverages & 12 Coffees. 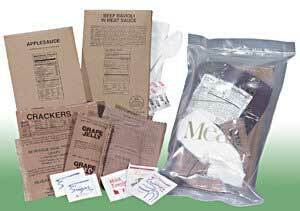 SHIPPING NOTICE: MREs Do Not Qualify for Free Shipment Due to Their Excessive Weight per Case. An Additional Surcharge will apply to CONUS Destinations. Please Contact Customer Service for Hawaii, Alaska, Puerto Rico and All Other OCONUS Zip Code Destination Rates. What Makes the Sure-Pack Full Prepared Meal the Best Choice? The U.S. Military's development of the "retort pouch" used in the well known MRE, Meal Ready to Eat Government rations led to a revolution in combat feeding for warfighters. The retort pouch used in the military MRE is actually filled with food, sealed and cooked for sterilization to ensure no intrusion of destructive bacteria. The technology finally allowed nutritious foods to be preserved and withstand storage for periods as long 130 months depending upon temperature conditions. These commercial meals are a natural for keeping in the vehicle for emergencies, stocking remote cabins and survival food caches. Note these meals do not come with heaters! 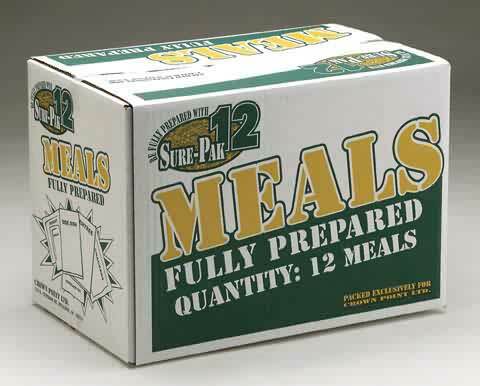 The Main Entrees used in Sure-Pak MRE meal cases can change frequently. Condiment Pack: * Spoon * Coffee * Cream * Sweetener * Salt * Black Pepper * Napkin * Moist Towelette * Each Meal weighs 1lb 12oz..
BMRE12: Case of 12 - buy and save!